I am posting my review on my wife’s blog. I was honored to receive the new Hydro 5 razor for sensitive skin. As, I always have to shave 3-4 times a week with my normal razor which is the Gillette razor. I was a little worried using the Hydro as I wasn’t sure if it would give me a close shave and leave razor burn after using. In the box was my razor and coupons to share with my boys. The packaging was nothing new for a razor which a package don’t determine if the product works. 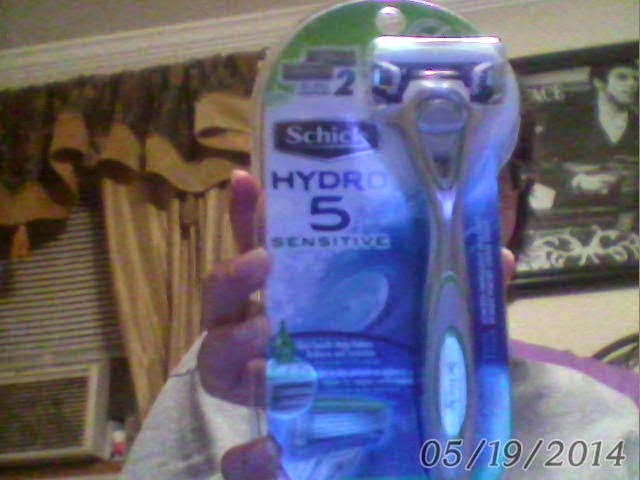 It came with 2 blades, one attached to the razor and one in a container that is behind the razor. Well now its time to talk about Shaving!!! . I used my shaving gel like always and put a nice glide on my face. Now I was a little worry how close of shave it will leave. As I was shaving I realized I didn’t have to go over the place I already shaved. Once I was done I was amazed that it left my skin feeling soft and smooth, as a few days past I realized, I never had a rash or a bump. I am really thrilled with this razor. I have told my friends and family what a wonderful job it did. I passed out the coupons and in fact I had a few buy the razor and they all gave me really rave reviews about this razor. I don’t think I am going to go back to my regular razor. I will be sticking with the new Hydro 5 for sensitive skin.